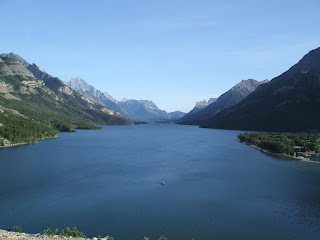 AN American guest at the Prince of Wales Hotel in the Canadian Rockies confided to his mates how he'd almost – just almost – sworn off the grog, after a session on the hootch that had left him confronting more in the way of spirits than he'd bargained on. 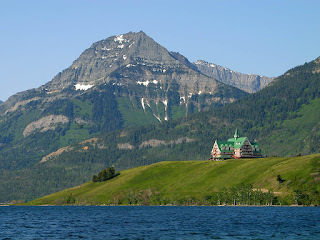 After a successful day's fishing on Waterton Lake at the foot of the hotel, the man had shared a whiskey or ten with his fellow anglers, and retired a little later than normal with another early morning on the lake weighing on his mind. Collapsing into bed, he was just dozing off when he was startled by the feeling that someone was tucking the covers in around him. Befuddled, he stumbled out of bed and switched-on the light. The room was empty. Putting it down to possibly one or three too many, he was soon heading back into the Land of Nod – when he was awakened again: but this time with the feeling that the covers were being pulled up around his neck. When he again stumbled from his bed, and realised that the room once more was empty and that he was in a lather of sweat, he swore that when he got home he'd book-in with either his shrink or AAs. He stayed awake for the rest of the night with the light on, and next morning red-eyed and sheepish, mentioned his experience to his companions over breakfast. A passing waiter overheard the conversation and interrupted. "Sarah!" he said with delight. "Our Sarah!" The American was flabbergasted. "You mean, some woman was actually in my room… tucking me in? Fella, you can tell this Sarah that if she comes into my room again, I'll report her to management, and have her fired!" "That would be difficult, sir," the waiter replied. "Sarah jumped off the roof over 20 years ago…. she's just heart-broken and keeps wanting to come back to us. "Quite a few staff have actually seen her over the years, while guests have said they feel her presence." Sarah, the waiter continued, was a teenage housemaid with a crush on another employee who showed little interest in reciprocating her feelings. So one night she climbed the hotel's bell tower and jumped 7-storeys to her death. Ever since there have been odd incidents of guests reporting that just as they've started to doze off, they've been startled by the sensation that someone was tucking the covers around them. One man even told fellow guests how he'd mumbled a sleepy "thank you" to his wife – only to turn over and realise she was in the shower. But the thoughtful Sarah isn't the only sad spirit roaming the rooms of the Prince of Wales Hotel. A married couple who worked there – he was a quick-tempered cook, she was a friendly and outgoing concierge – had a blazing row in the staff wing one Friday night after the wife had come to bed late after playing board games with other staffers. Angry that she'd given her time to fellow staff and not him, the husband beat her senseless and fled the hotel. When neither appeared for work the following Monday, management broke in and found the body of the wife; to this day, the husband has never been found. But his wife's ghost is said to be felt around the old staff quarters that are now guest rooms. "People say they simply 'feel' there is someone in a room with them, a sort of a warmth as if someone's body heat is close to them," one duty-manager said. "It's eerie, but not worrying. The poor woman, just like Sarah, loved the hotel and is just looking for companionship amongst old friends." You'll find the Prince of Wales Hotel a delightful retreat on a North America summer holiday, particularly if you are into long walks, canoeing, sailing, fishing and other myriad outdoor adventures – and good dining. And you won't have to worry too much about its ghosts: encounters with Sarah and the outgoing concierge are few and generally far between. SPIRITED retreat that almost put a man off the drink.